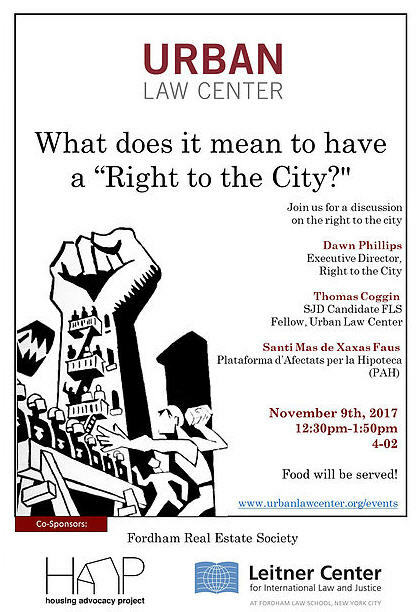 Last November 9th 2017 PAH participated at a Fordham University School of Law panel: What does it mean to have a “Right to the City?” In the panel, in addition to PAH, took part Thomas Coggin, SJD Candidate FLS Fellow, Urban Center and Dawn Phillips, Executive Director Right to the City. It’s not usual that you can contrast in the same panel the academic point of view and the activist one. This is precisely what made this panel a very interesting one. Thomas Coggin presented the academic concept of the Right to the City (RTC) and talked about Henri Lefebvre and David Harvey. In contrast to his academic view that most of the times we think it just stays in a classroom or meeting room, Dawn Phillips explained how Right to the City organization is a national alliance of racial, economic and environmental justice organizations that through shared principles and a common frame and theory of change, builds a national movement for racial justice, urban justice, human rights, and democracy. PAH also presented its success case study of how civil society can self-organize to fight and gain its rights. PAH example with no professional activists, with no political party, union, ONG or any other organization behind, with no additional funding other that the ones we can self-generate and private donations, with no hierarchy, no president, no organizer, no board etc.. all being decided in open assemblies, can become such a successful case stopping thousands of evictions, retaking from banks empty houses and allocating vulnerable families, forcing banks to accept deals that allow families to have a real second opportunities with affordable rents and no debts or passing laws in many Autonomic States to guarantee the right to housing. Laws that have been taken to the Constitutional Court by the right wing Partido Popular but that haven’t stopped us from presenting our actual Ley Vivienda PAH campaign.